Lance qualified from the University of Cambridge in 1989 working in small animal and exotics’ practice. Lance was Honorary Lecturer in Exotic Animal Medicine at the University of Liverpool from 1996 to 2008. In his time he has lectured both abroad and locally to veterinarians, veterinary nurses and students He has worked solely in the exotics’ field since 2000 and in 2003 set up ‘vet4dragons’, his own exotic animal veterinary consultancy. 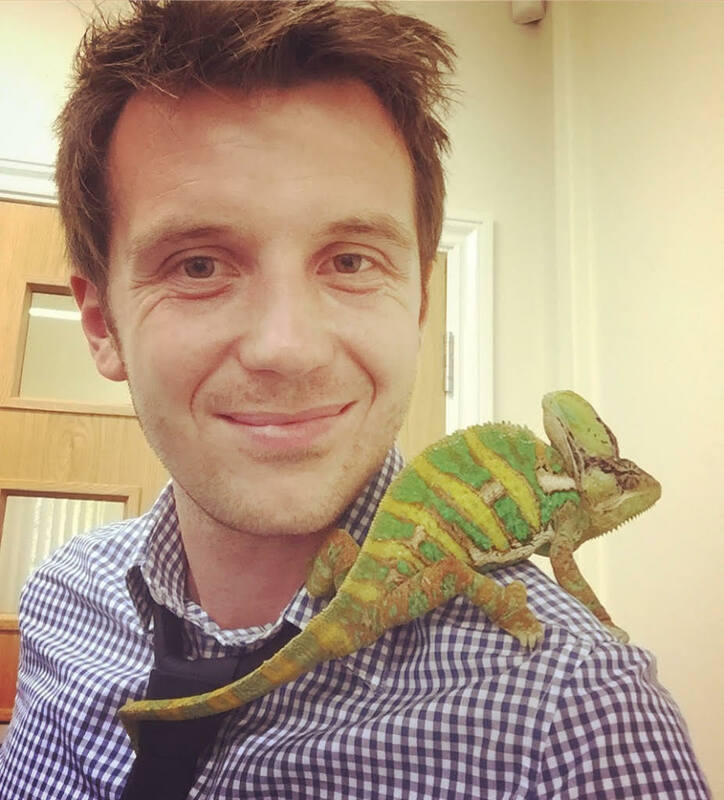 In 2012, along with a colleague, he started Origin Vets – a veterinary service dedicated solely to exotic and zoological animals. Lance has authored a number of books including a veterinary text book, pet care books on aquarium fish and reptiles, plus magazine articles and contributions to other books. Sophie decided at the tender age of 4 to become an “animal doctor”; she just wanted to work with animals and nothing could stop her. At 5 years old she had a pair of gerbils, and by 7 her first dog. At 12 years old, she had read up for several months on various reptiles and decided on her first (of many) bearded dragon. In 2008, Sophie graduated from the Royal Veterinary College, and after a period of travel within Australia, including working in the wildlife hospital at Australia Zoo, she settled in her first job at a small animal practice in Newport, South Wales. Her gift to herself for graduating was her first panther chameleon named Neptune. At just 4 weeks graduated, Sophie was undertaking internal tortoise surgery and successfully completed her first ovariectomy and bladder stone removal in a spur thigh tortoise. In 2010 Sophie completed a General Practitioners certificate in Exotic Animals Practice and so, in 2011, Sophie moved to her second practice in order to increase her exotic work load. In 2013, Sophie felt that her love for exotics was so strong that she joined forces with the dark side and became part of Origin Vets. 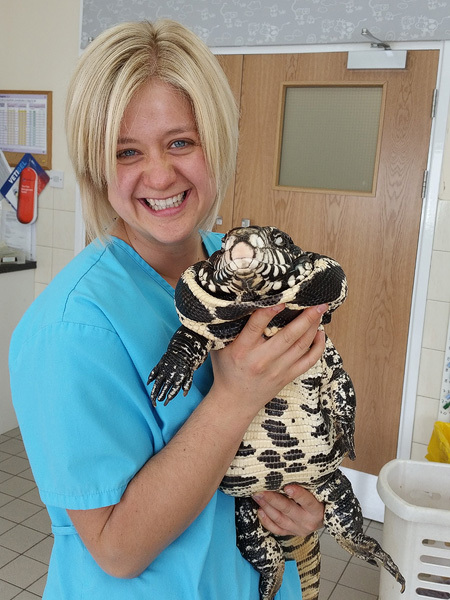 Sophie hasn’t looked back since, and in 2016 she completed her Post Graduate certificate in Exotic Animals achieving the status of Advanced Practitioner in Zoological Medicine. She joins only 25 others in the U.K with this veterinary status for exotic animals. Sophie is particularly fond of rabbits, having five rescue lionheads herself. She also has a Lhasa Apso named Ozzie, and two ragdoll cats, Logan and Pheobe. What about the more exotic pets you say? Well after many successful years of breeding several species of chameleons, Sophie at the time of writing has just two panther chameleons, 1 pygmy chameleon, three bearded dragons and two rescue Horsfield tortoise. She also has two tropical fish tanks for relaxation time. Even when she is not working with animals, Sophie loves to spend her time with them. She spends many weekends mountain walking with Ozzie and enjoying wildlife photography – she has even had several of her photos exhibited in two galleries in South Wales. After graduating from Bristol Vet School in 1991, Tom worked in a variety of free-living and captive wildlife projects and hospitals in Africa and the Middle East. In 1991 Tom led a team of Bristol University students called the Savannah Wildlife Project to conduct research on duiker antelope, and establish a veterinary centre and education facility at the Chipangali Wildlife Trust in Zimbabwe. In 1992 along with Dr Jaime Samour, a renowned international avian veterinarian, Tom helped to develop the veterinary department for the National Avian Research Centre, a large captive breeding and restoration project for bustards in the United Arab Emirates. Here too he was fortunate to do his PhD. Tom returned to the UK in 2001 to do the MSc in Zoological Medicine at the Zoological Society of London. After a year in the UK the Middle East beckoned again and Tom worked at Dubai Falcon Hospital and the Wadi Safa Wildlife Centre in Dubai until 2011. In Dubai Tom provided veterinary support to a turtle rehabilitation project and a number of large private zoological collections. From 2011-2014 Tom was Head of Aviculture and Health at International Wildlife Consultants, responsible for the veterinary care and aviculture programme of a large raptor conservation and falcon breeding project in the UK. In 2014 Tom taught courses on Animal Welfare and Wildlife Rehabilitation at the Coleg Sir Gar campus of the University of Wales, Trinity Saint David. 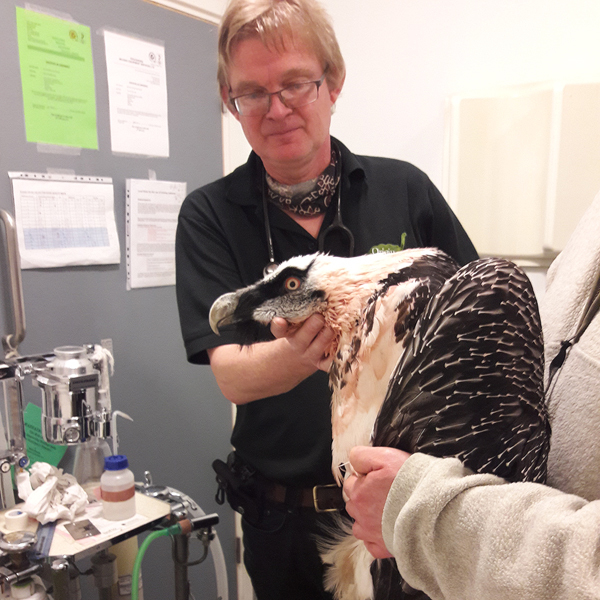 Tom holds a Diplomate of the European College of Zoological Medicine (Avian), has published over 100 journal and book articles and edited newsletters on raptor conservation and wildlife conservation. In his spare time he enjoys bringing up his family on an environmentally friendly small-holding on the Pembrokeshire Coastal National Park. 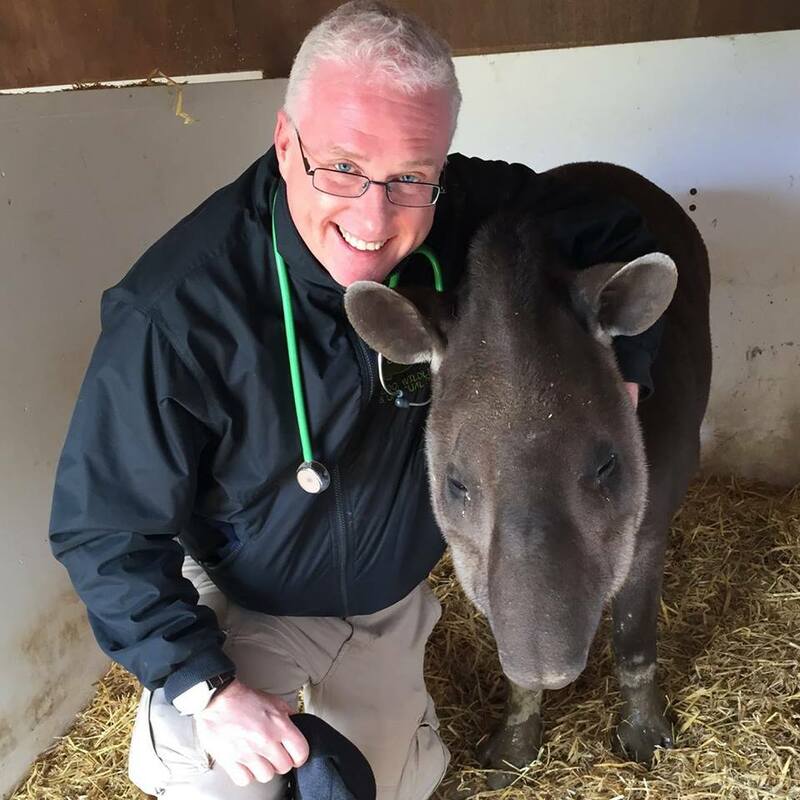 Prior to joining Origin Vets, Kevin worked as a GP in mixed practice, where his patients included horses, farm animals and domestic pets, as well as a variety of wildlife, exotic and zoo animals. Kevin was awarded a Distinction in his Veterinary degree from Liverpool University. He has also completed a masters degree in Veterinary Conservation Medicine and a Bachelors degree in Zoology. He is currently studying for a Certificate in Advanced Veterinary Practice, specialising in Zoological Medicine. He is a member of the British Veterinary Camelid Society, Veterinary Deer Society and British Veterinary Zoological Society. In addition to treating patients at our clinics, Kevin is available for visits and provides veterinary care for several ‘exotic herds’ including reindeer, alpaca and other larger animals. Along with Tom and Lance, Kevin is also part of Origin Vets Zoo Veterinary Team. Both Kevin and Lance featured in the recent BBC TV programme ‘Vets 24/7’.